My wife loves Diapers.com. 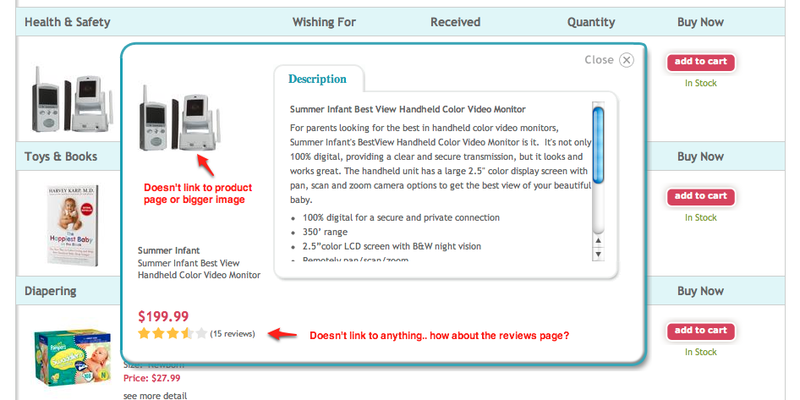 I agree they do a good job of having a clean, simple website geared completely towards baby / registry / infant stuff. They have her hooked. But one thing absolutely drives me crazy and has more than once slowed me way down and I even left their site and used Amazon (to look up the exact same product!!). When viewing a registry page (such as our own), suppose you want to view an item in detail before adding it to your cart. Or suppose, in my real life example, a friend was interested in the product you registered for, and you want to email him the product page (with images, reviews, description etc.. you know, a critical landing page of an e-commerce site). Well, you can't. They tease you though. There is a "see more detail" link, which opens this lightbox. But the image is not clickable, so too bad if you want to see more photos or a closeup. The word "Description" becomes underlined and the hand cursor appears on hover, but clicking it does nothing. Same with hovering over the stars and "15 reviews" text. Nothing. I understand them wanting to keep the registry simple and make purchases a no brainer.. but once you clicked "see more detail", why not let users see the full product page? I had to copy and paste the product name and paste it in a search window (that's when I left for Amazon), in order to email a friend information on the product! Lesson: hiding information and keeping things simple is a good thing. But when you prevent exploration, research, and information sharing, you can easily lose paying customers. Also, don't provide visual clues for something to be a hyperlink, and then have it go nowhere. Okay, you're right... this would drive me nuts.